ZARA STRIPED LONG TUNIC SHIRT DRESS WITH BELT SIZE S UK10. Gold buttons, very classy and stylish. Condition is Used but worn just once. Dispatched within 2 days. Lovely Monsoon Hippy Boho floral Dress size 12. This is a 70's inspired dress with the great design and quality you would expect from Monsoon. Button detailing on sleeves. In excellent condition as only used a couple of times. Dispatched with Royal Mail 2nd Class. From a smoke home. UK bidders only. Black floral patterned tunic dress size 10. By JOE BROWNS. very hard to show exact colour ~ close but not 100% exact. Elasticated panel to the back of the waist for comfort. 17" - 18" From pit to pit from flat to slightly stretched. MARKS SPENCER. Big beautiful clothes and gifts for the curvy lady. STUNNING CRUISE PARTY EVENING. AND I GIFT WRAP FREE ALSO. MOTHER BRIDE -WEDDING GUEST WEAR. BNWT ALSO HAVE OTHER GORGEOUS GIFTS AND DRESSES LISTED. NewJoe Browns Escape to The Dream Tunic Dress. ( prevent fraudulent activity ). Flowing floral skirt. Skirt: 100% Polyester. Flattering mock wrap bodice. Body: 100% Viscose. No fastening - pull on style. SO BEAUTIFUL FLOWING MARKS SPENCER NATURAL ANIMAL PRINT RELAXED FIT LONG SLEEVE DRESS. 49" LONG MIDI TO MAXI DEPENDING ON YOUR HEIGHT. MARKS SPENCER £49. MOTHER BRIDE -WEDDING GUEST WEAR. Big beautiful clothes and gifts for the curvy lady. Just an easy to wear dress for many occasions. 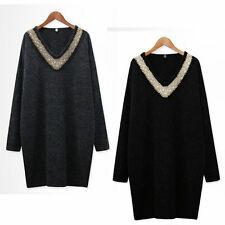 Dress Top has a v neck and long sleeves, it is much longer at the sides, great on its own or layered, has been worn but in as new condition. chest 48" 122cm length at sides 44" 112cm length at centre back 38" 97cm. MONSOON size 16 Beautiful Boho Style, Floral Print Dress. Drawstring waist. Never been worn. This dress has been worn once. Joe Browns Cotton long sleeve Tunic Top Size 18 black / hippy aztec pattern VGC . Condition is very good but Used condition. Dispatched with Royal Mail 2nd Class. Black cotton tunic style dress with lace up neckline. Long sleeves with elastic around wrist. Size Small. This chic Minkie dress fits a Size 12 to 14 depending on how fit your preference. and bell sleeves that are elasticated so that you could easily roll the sleeves to a quarter length. This dress features a unique mix of eye-catching colours in stripes, with two front pockets. Zara Ladies Peasant Dress Size SX Beige Black Festival Boho Cotton Long Sleeves. Has pockets.Condition is very gently used. Length is approx 44 inches and waist measures approx 16.5 inch when laid flat. Any questions please ask I am more than happy to help. We are having a family clear out so have a look at my other listings, I am happy to combine postage. Proof of postage always obtained. Pet and smoke free home. 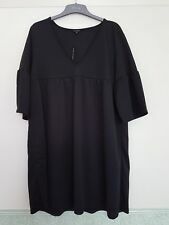 Reduced here it is a Fab, Comfy, Slouchy Dress XXL by German Designer Label Rundholz Black Label Chest 76 " very roomy Length 44" Exact material 90% cotton 10% wool Features buttons down back At the front of dress there is a section that can be flopped out or pushed in to create pocket effect. See last pic. Art to Wear indeed! Excellent Condition. Happy to answer any questions. 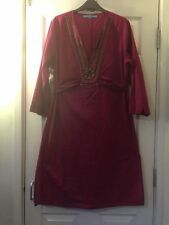 Fat Face Ladies Tunic Dress Size 16. Condition is Used. Dispatched with Royal Mail 1st class signed for. Pretty dress in good condition. Pull over head style and unlined. Grey with purple, turquoise and yellow. Twist to left hip and sleeves. Measures 22 inches from underarm to underarm. Navy East Embroidered Tunic Dress Knee Length Heavyweight Viscose Size 18. Condition is Used. Dispatched with Royal Mail 2nd Class. FAB FLOATY DRESS. JOE BROWNS . KNEE LENGTH. STUNNING JOE BROWNS TUNIC TOP IN TEAL AND BLUES WITH SQUIRRELS - LONG SLEEVE - V NECK - LONG ENOUGH TO BE WORN AS A DRESS - A REALLY FUN TOP. SLEEVE - 18". LENGTH - 33". River Island ivory with blue Floral Dress Size 18. Bought new for £45 and never worn. Still has tags on. Perfect for summer. Dispatched with Royal Mail 2nd Class. A lovely floral longsleeve tunic dress from M&S INDIGO size 10. TU Swallows Dress. Size 18. Condition is Used. Dispatched with Royal Mail 2nd Class. Very pretty New Look, floaty, floral dress. Machine washable. RED BOHO COLD SHOULDER DRESS SIZE 16 NEW WITH TAG! RED & BLACK BOHO COLD SHOULDER DRESS SIZE 16 NEW WITH TAG! Black with red flowers. Lined. Ties at back.v neck front & back. Length 35" thanks for looking! Condition is Used. U nd er a rm sleeve 17. 5 ”.